Food Allergy Research and Education (FARE) is seeking a simple way to help “create a safer, happier Halloween for all” by raising awareness of food allergies to help include all trick-or-treaters into the Halloween holiday. FARE estimates some 100,000 households will take the pledge this year. 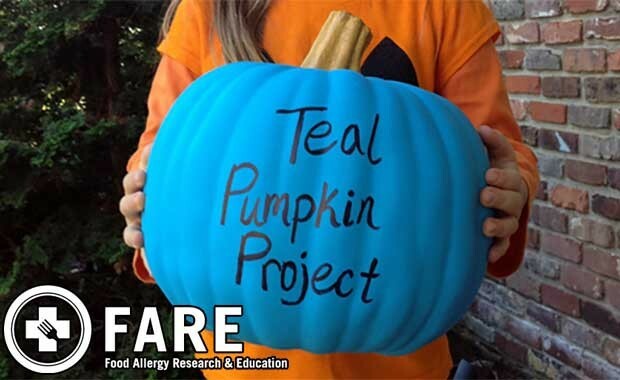 To participate is easy: simply paint a pumpkin teal to place in front of your home with a free printable sign from FARE (available on the website) to show you have non-food treats available. Food allergies are a serious threat to families. One-in-thirteen children suffer from some form of food allergy. The fun of Halloween can be a scary situation to parents who have to pick through candy to make sure it is safe and the threat they may miss a piece worries millions of parents each and every year. For more information or to donate to the project, head on over to FARE’s site today!